Drove all the way up to Gareloch on Friday leaving at 4am and arriving at 12.30pm. No problems, lovely weather, just fantastic. Probably the only trip up here that goes so smoothly. Arrived to find lots going on in the yard and met some of the local characters and introduced myself to Jean - who is in charge. The weather was hot and fine, even worked in a T shirt. Started by opening up the boat and moving the cushions out to air on deck then got down to cleaning a couple of months of mould off the vinyl, locker surfaces etc. That took the rest of the day. Cooked supper fell into bed. Saturday carried on cleaning then painting out all the lockers and aft berths. The weather had turned windy overnight with rain and hail squalls coming in from the west. Luckily the boat is bow on to the incoming weather so it is relatively easy getting in and out of the hatch. By keeping my wellys under the boat and only using deck shoes on the boat I have kept the inside clean and dry by changing footwear as I come and go. Not many people working on their boats I guess because of the weather. 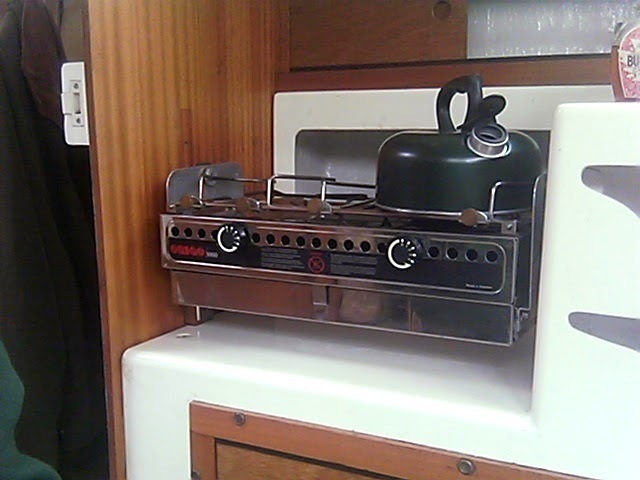 I have cleaned the cooker, it is shiny,shiny - discovered my kettle leaks, not badly just enough to leave a puddle on the cooker over night. Today I will explore the electrics and do some work on the outside of the boat - assuming the weather cheers up. I'll post some videos when I get home.